I have always been a bit of a klutz. Okay, anyone who knows me knows I am prone to accidents, spills, slip-ups and more. I’ve had my share of embarrassing moments, and accidents. And Sunday was no exception. I was enjoying a beautiful Mother’s Day; my kids had given me some wonderful gifts which included a pot with a flower, a couple of handmade cards from my Little Bird, and a “foot-stamped” butterfly on canvas from my Little Mouse. After a yummy dinner of Greek food, we were all going down to the basement, so the kids could play and as I turned to pick up my Little Mouse and go down the stairs, I fell. Luckily she was fine, but I ended up on top of my right foot, stuck on the landing. I could hardly move I was in so much pain! So, we called my parents, who came straight to our house and my husband took me to the hospital. After two sets of x-rays, they said I didn’t break anything, but that my foot and ankle were severely sprained. I can hardly walk. My armpits hurt from the crutches. I’m bruised all over. I can’t drive. And I’m not a happy camper. I’m sorry my kids had to witness that fall, and my reaction afterwards, as I know they were scared. I’m so grateful that my Little Mouse didn’t get hurt. I was telling somebody about it, and she said that I probably got so hurt because my instinct was to protect her. She’s probably right. I have to be more careful. Every time my kids are on the stairs, I always tell them to pay attention, going up or down and to look where they are going. And always hold the hand rail. I didn’t do any of that on Sunday. I guess it’s time to practice what I preach. 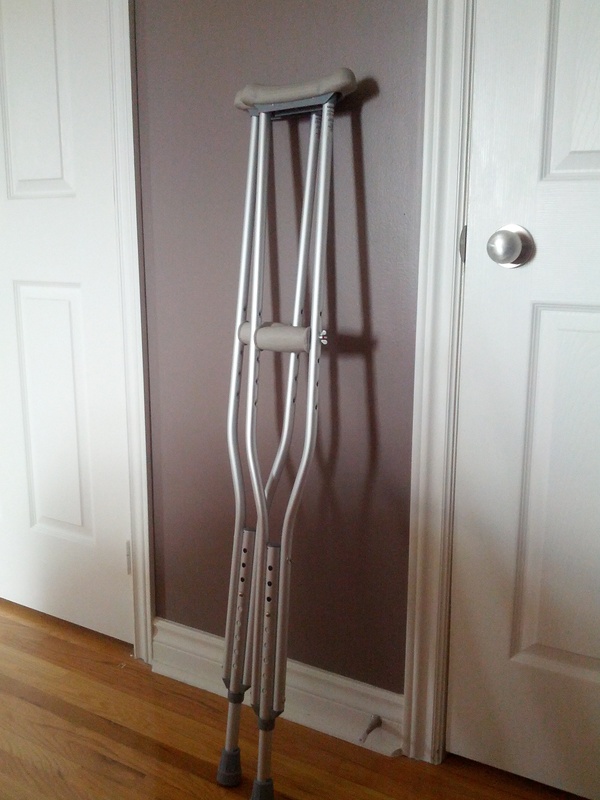 Life is definitely more difficult with crutches. Hopefully things get better soon. Have you ever had an accident with your kids? Have they ever thrown your words of caution back at you? I’d love to hear about it.